Überraschend reifes Werk, in dem mehr dem Elektropop statt Teen-Geschrammel gefrönt wird. Wie so oft wird das beste an den Anfang getan, dann wirds erstmal grausam, dazwischen ein halb gelungener Titel und dann wieder grausam. I flicked through this album for the first time in years today and I have to say I have really fond memories of this album. It's strong beats from start to finish and doesn't slow the pace at all. Most of the time I would view this as a downfall, but it works for Hilary I reckon. I also think this album was successful as a departure from her previous style (although obviously not so much a commercial success). I like it and this would be amongst my top ten albums of 2007. 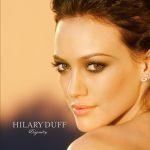 Not Hilary's best album, but still couple of songs are really hot.